You can’t make this stuff up, unless you’re Shakespeare. Romeo and Juliet got nothing on these kids. I don’t normally read true crime novels, but the sample text for this book was such a draw that I grabbed it, and I’m very glad that I did. 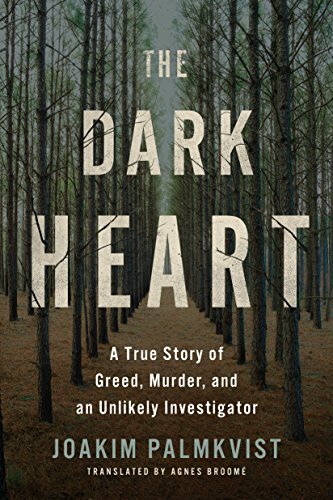 The Dark Heart is an efficient, engrossing read that even while fictionalized is not sensationalized, but comes across as a prolonged journalistic article revealing fact after fact surrounding a 2012 missing person’s case in Sweden. Göran Lundblad disappeared, leaving behind a life born into and driven by greed and control, where family and money count above all, where money is placed above family, and generations of two feuding families hate each other across the mis-mapped piece of land between them and work their children like serfs. I found it amazing that the missing man, Göran Lundblad, was so limited by his parents that he did not have any control over his life or his finances until he was sixty years old and his father went into a nursing home. Each of the families ground their children (and their spouses when they married) under with authoritarian parenting, making them slave long hours for their room and board. Göran was not as bad as his parents or his neighbor/nemesis Åke Törnblad. But this disputing over a piece of land reads like Romeo and Juliet when Göran’s daughter, Sara, takes up with Åke’s son, Martin. When Sara refuses to leave her relationship with Martin over the course of many years, Göran finally stops fighting with her, and starts limiting the damage she can do to the family’s finances, in a family, where money wins over all. In the process Sara eventually signs over the rights to her properties to her father, although she keeps her loss of fortune a secret from her boyfriend. When Sara reports Göran missing in 2012, there aren’t many leads. The case stumbles to a stop, but is reenergized when Sara’s younger sister, Maria, calls the police to voice her fear that Sara was involved in her father’s disappearance. Sara has been strangely cold and unaffected by the disappearance, almost immediately beginning to renovate her father’s house, she has been grabbing control of her father’s lands and properties, siphoning off his money, and she’s aligned herself with a loser boyfriend and his family, who are the sworn enemy of her own. But the case is cold and gets colder. There’s no body, no evidence to prove a murder. Just property and bank accounts waiting to be inherited. Therese Tang runs a branch of a Missing Persons organization. She’s driven by her past, by her memories, and by her drive to find those who are lost, whether they’ve disappeared through accidents, suicide, or murder. Most of the time, their targets are dead, and this time, he surely is. But that doesn’t mean Therese is going to stop looking. She’s got angles the police aren’t allowed to pursue, even if she doesn’t have quite their resources. But she’s got her imagination, her drive, her ability to connect with people and make them trust her. All she has to do is find the right person, the right lever, the right fact. Sooner or later, she’s going to find Göran… if it kills her. And it just might. A gripping tale of greed, corruption, twisted love, and a lot of people trying very hard to do the right thing. Highly recommended for those who like mysteries, crime stories, and regional history. The translation is pristine and crisp, the writing indelible, and the mystery is humanity at its worst and best.